"By 1958 the transistor indus­try faced another crisis. ... Jack Kilby soon [solved] it. A slow-talking Kansan with a leathery face, Kilby had spent a decade in the high-tech boon­docks (Milwaukee) before landing a job at Texas Instruments (Tl) in 1958. Though trained in electrical engineering, Kilby was hired to solve a computer hardware problem known as the tyranny of numbers. Basically, though cheap silicon transistors worked okay, fancy computer circuits required scores of them. That meant companies like TI had to employ whole hangars of low-paid, mostly female technicians who did nothing all day but crouch over microscopes, swearing and sweating in hazmat suits, as they soldered silicon bits together. In addition to being expensive, this process was inefficient. In every circuit, one of those frail wires inevitably broke or worked loose, and the whole circuit died. Yet engineers couldn't get around the need for so many transistors: the tyranny of numbers. "Kilby arrived at TI during a sweltering June. As a new employee he had no vacation time, so when the cast of thou­sands cleared out for mandatory vacations in July, he was left alone at his bench. The relief of silence no doubt convinced him that employing thousands of people to wire transistors together was asinine, and the absence of supervisors gave him free time to pursue a new idea he called an integrated circuit. 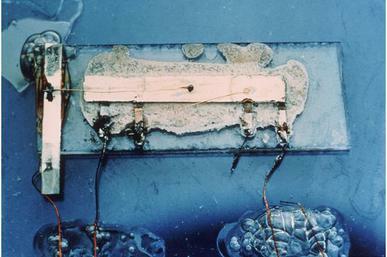 Silicon transistors weren't the only parts of a circuit that had to be hand-wired. Carbon resistors and porcelain capacitors also had to be spaghettied together with copper wire. Kilby scrapped that separate-element setup and instead carved every­thing -- all the resistors, transistors, and capacitors -- from one firm block of semiconductor. It was a smashing idea -- the dif­ference, structurally and artistically, between sculpting a statue from one block of marble and carving each limb separately, then trying to fit the statue together with wire. Not trusting the purity of silicon to make the resistors and capacitors, he turned to [the element] germanium for his prototype. "Ultimately, this integrated circuit freed engineers from the tyranny of hand-wiring. Because the pieces were all made of the same block, no one had to solder them together. In fact, soon no one even could have soldered them together, because the integrated circuit also allowed engineers to automate the carving process and make microscopic sets of transistors -- the first real computer chips. Kilby never received full credit for his innovation ... but geeks today still pay Kilby the ultimate engineering tribute. In an industry that measures product cycles in months, chips are still made using his basic design fifty years later. And in 2000, he won a belated Nobel Prize for his integrated circuit."